Jimmie was born in 1943 in Lake Tahoe, CA to parents Lucille and Pascal Heuga. Pascal was a Basque immigrant who ran the cable car at the Squaw Valley ski resort. Jimmie began skiing at age two, and in just three years, was competing in the junior race circuit. In 1958, at 15, he was named to the US Ski Team, coached by Bob Beattie. Jimmie remains the youngest man ever to make this prestigious roster. 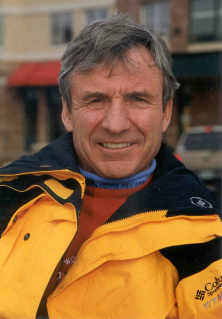 In 1964 Jimmie won the bronze medal in the slalom during the Winter Olympicas at Innsbruck, Austria. Jimmie and Billy Kidd were the first American men to medal in men’s alpine skiing at the Olympics. They were preceded by Jean Saubert, the first American woman to medal during the same Olympics. This marked a turning point in US Olympic skiing. During the 1968 Olympics, Jimmie experienced his first early symptoms of MS.
Jimmie was formally diagnosed with MS in 1970, at the youthful age of just 26. Pioneered lifestyle empowerment programs for people living with MS by focusing on what each person can do. This multi-disciplinary philosophy of care utilized exercise and nutrition to combat the effects of the disease. Founded the Heuga Center in 1985. Jimmie tapped the goal-setting skills her learned from Coach Beattie and built a fitness and wellness program based on exercise and positive thinking. At the same time, the progress of the disease slowed significantly, suggesting that exercise, though no cure, had deterred the debilitating effects of MS.